During the Q&A portion of his interview at the WSJ.D conference tonight, Tim Cook was asked about the iPod classic, which was finally discontinued last month five years after its last update. Cook said Apple primarily stopped making the device because it was no longer possible to source the necessary parts from anywhere in the world. 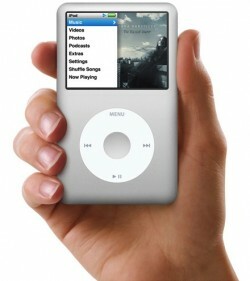 Apple does not have plans to reintroduce the iPod classic due to a shrinking audience and the engineering costs that would be needed for a new version, but Cook pointed towards the iPod touch, which has almost the same amount of storage space, as a viable option. Observers had speculated Apple was waiting for a 128 GB iPod touch before discontinuing the iPod classic, but while the iPhone and iPad have gained 128 GB options, the iPod touch has yet to do so. Still, with Apple unable to source parts for the iPod classic, the company was left with no choice but to end sales of the descendent of the original iPod. The iPod classic's 1.8-inch hard drives were typically supplied by Toshiba, with the last generation using a 160 GB drive. Toshiba launched a 220 GB version in early 2011 that gave some hope the iPod classic might receive an update, but one never came to pass and Toshiba has long since discontinued its entire line of 1.8-inch hard drives. They have enough money to buy third world countries but can't pay someone to make some parts? BS. But that doesn't mean that it is profitable to do so. Sometimes I wonder if people are more concerned about commenting first than readying the article. It's a waste of money to develop an updated version with low sales. I don't believe him either. Bummer. Our iPod Classic just kicked it, and I was hoping to replace it with another. One of Apple's greatest products. Just because Apple could, theoretically, spend tens of millions -- or more -- to set up a factory to manufacture the iPod classic doesn't mean it wouldn't be a waste of money and resources. Hardly anyone was buying the thing. That's the hard truth. If people were buying it, then they obviously would have invested the money and resources to keep manufacturing it. That's not to say it isn't sad to see it go. But it's simple economics. Apple is a business and there's no excuse for them to waste money just for the sake of nostalgia. Heck, if you want to bring Steve into it, Steve was dead set against that sort of thing. Hence why we never saw a 25th Anniversary Mac or a 10th Anniversary iPod, and why there wasn't even a mention at all in 2006 about the 30th anniversary of Apple's founding. I'm sure after the iPhone 6 demand has leveled off - probably sometime in February or March - they will quietly reconfigure the iPod touch storage options to 16, 64, and 128 GB in line with the phone and the iPad. How about ditching the old hard drive and use flash memory in there. And it doubled as a external hard drive if you knew how to set it up.